Now it makes sense to me why. Feelings like this show us that we need to trust our gut instincts. Living in Spain not only gave me valuable life experiences, but also a taste of independence, pure happiness, life long friends, life long memories, the ability to travel around the whole of Europe, knowledge of a new language and the opportunity to spend a good amount of time in Eastern Europe with my family. It also was where I met the love of my life, who then after a few years inspired me, pushed me, and believed in me to do something I would never have done. Sometimes in life you just need to trust the universe and let it guide you. That’s what happened when I came to Seville. Now, years after living in Seville I always return. It is of course, never the same. I always walk through the street that I lived on. This tiny, tiny street in the centre of the city. I get flashbacks to different moments in the past. Like the moment when my friends and I moved into our little Spanish apartment. Our landlord told us to come that morning, but when we got there at 9 am with all of our suitcases, the place wasn’t ready. They were still finishing to renovate it (typical Spain). So what could we do but wait? It was pouring rain and winter time in Seville. So we went and got some tapas at Bar El Refugio…the bar directly opposite us (this place would become our future go to for tapas). The bar was actually happy to open the doors to us, even though it was super early. It was cold, so we thought okay lets have some wine. We all had class that day but it felt really nice just to be a bit carefree. We cancelled our day and went with the flow. So that morning we ended up having our own impromptu housewarming party on the street that our apartment was on…we thought lets just celebrate moving in. This basically included a feast of Spanish tapas, lots of wine and then when we finished at Bar el Refugio we walked over to the restaurant below our apartment (Also owned by our landlord). It was probably midday by then. We danced, drank, and then climbed up to the rooftop of our apartment. It was raining all day but the sky had cleared and our apartment was nearly finished, just a normal weekday, it was probably the best moving in day I’ve ever had. It was also the universe giving us a nice introduction on what it was going to be like living there. Moving into our Spanish apartment is only 1 small memory that I have from this city. Sometimes I reflect and think, how can a place give you so much? Every time I return to Seville there is this feeling that I get when I walk through the streets…an acknowledgement that this place changed my course in life. There is this deep sense of appreciation when I walk on the pebble stones, when I look at the familiar sights where I used to spend my days, and that smell in the air…it always reminds me of the pure, genuine, reality that I felt. It’s like the city can talk, always welcoming and giving its energy to you. At all times and hours of the day or night. It’s a city that is more alive than some of the biggest cities in the world. That is something I am super grateful for experiencing for a year of my life. Visit the stunning Cathedral of Saint Mary (also known as the Seville Cathedral). Walk all around it and explore inside too! Climb the Giralda tower which is connected to the Cathderal. You will see absolutely stunning views of the city! Visit Alfalfa. This is the best area to go out with lots of good casual bars. Don’t come before 10pm though! Check out Blues Bar, Ruko, and the recently opened Bodega la Aurora owned by my good friends. I’ll have more on where to go out, drink and eat in my next blog post and video! Stay out all night with friends, drinking wine or cerveza. Then make sure to walk the streets, that are silent, still, yet alive. Have a barbecue or make paella on a rooftop with friends. Most hostels and hotels can recommend where you can do that, and some organise it themselves. Visit Seville during La Feria – The festival runs around the month of April after Easter. Spring time is probably my favourite time to visit! It’s when the city is warm but not overally hot, the sun is always shining, all the festivals and parties begin and theres an amazing vibe in the city. 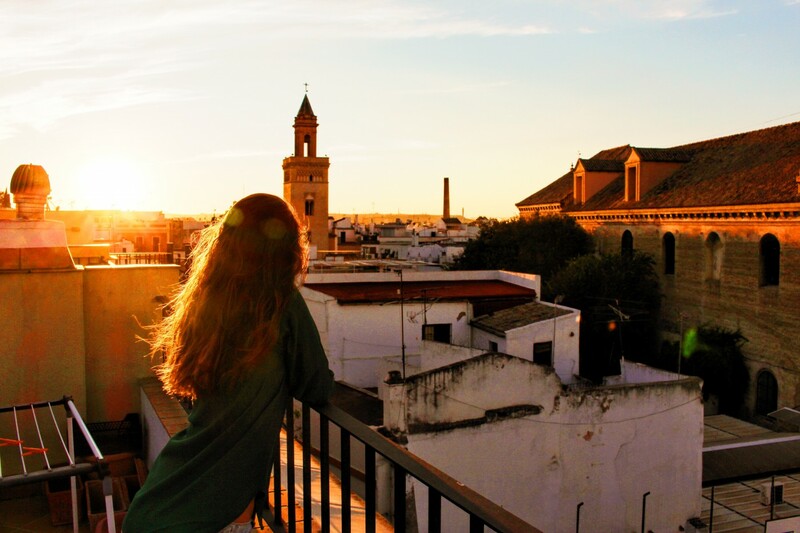 If you are a student and have the opportunity to study in Seville…do it! The city is full of university students and it’s an incredible city to live it. Visit the Arabic Baths! So nice to relax and unwind at these baths any time or day of the week. Follow the link to their website here. Make sure you book. Visit or stay at Hotel Alfonso. A stunning and historic hotel right in the centre of Seville. Visit or stay at Hotel Eme. The rooftop bar is great for a drink at sunset! Right next to the Cathedral. Stay in an Air BnB like this one or this one... owned by my friends who will take you out and show you around! Visit the Flamenco museum. You can watch a flamenco show there that is more theatrical than others. Watch a more traditional flamenco show in Triana. Take a walk to Alameda in the evening and enjoy the vibe there by having a few drinks in the centre square. Enjoy some boutique shopping around the streets of Encarnacion. Walk over to Plaza De Espana! Explore the Alcazar of Seville. This stunning palace is a must! Go early in the morning or later in the afternoon. The gardens are so pretty so pack a light picnic of jamon, manchego, fruit and fresh bread. Eat, eat and eat!!! I’ll be posting a food guide this week so check out my top places for eating! Awesome post and really nice pics! Thanks Vincent!!! Glad you like it. Beautiful times, people and city! Yes…very grateful for the times and memories!